How Do I Purchase Additional Lead Retrieval by Attendify Licenses? 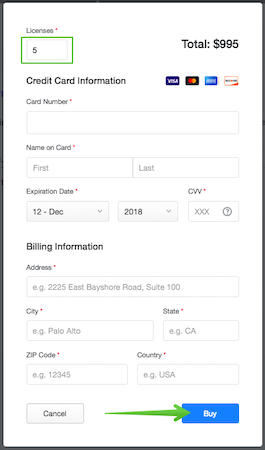 Follow these simple steps to purchase additional licenses for your Lead Retrieval by Attendify app. Go to your Leads dashboard and open the event you want to add licenses to. 2. Go to the Settings > Pricing Model to check the number of the licenses left, and click on the "Buy Licenses" button to get more. 3. Choose the number of licenses, fill in the payment information and click "Buy".